Ironstone is a ceramic invented in the early 1800’s. The recipe for making it was invented in 1800 as a new way to produce earthenware and porcelain. But the company went bankrupt and the patent was given to Spode. In 1813 another ceramacist, Charles Mason, registered the patent for what he called “Ironstone”. He didn’t invent the process or the ironstone recipe … he’s the one who came up with the great name for the material that was invented as a cheaper porcelain-like ceramic. Also Ironstone doesn’t contain iron. Mason, who was clearly an evil genius, named the product “Ironstone” to reinforce how strong the product was and also, rumour has it, to confuse competitors. Mason, made his recipe public to other competitors in the day, explaining the complicated process for preparing the iron slag components that went into his ironstone. Only his recipe was a lie and his product didn’t contain any iron at all. When I redid my kitchen last year one of the things I knew immediately was that I was going to start collecting Ironstone bowls. I already have a very real obsession with antique bowls so starting an all new, very specific collection, was all kinds of exciting. My old collection of bowls is multi coloured which went with my eclectic 1940’s kitchen. Red, green, blue and yellow. Great depression era bowls that weren’t going to look good in my new kitchen at all. Well I’m sure they’d look good but it wasn’t the look I was going for. I wanted more of that calm, Swedish country look. Ironstone it is I decided. It’s white/off white, inexpensive for the most part and relatively easy to find but not so easy that collecting wouldn’t be fun. If you can find all the pieces you need or want in one trip to the flea market it kindda takes the challenge out of building a collection. Since last year I’ve acquired several bowls, platters and a jug. But I wanted more bowls and in particular I needed a big bowl. Medium sized bowls seem to be easy to find, but the larger ironstone bowls are harder to come by. So on my latest trip to Christie’s Antique Sale I was able to ease the pain of not finding a classic midcentury modern chair by filling bags with Ironstone. I got 2 gravy boats, a platter and a perfect bowl. 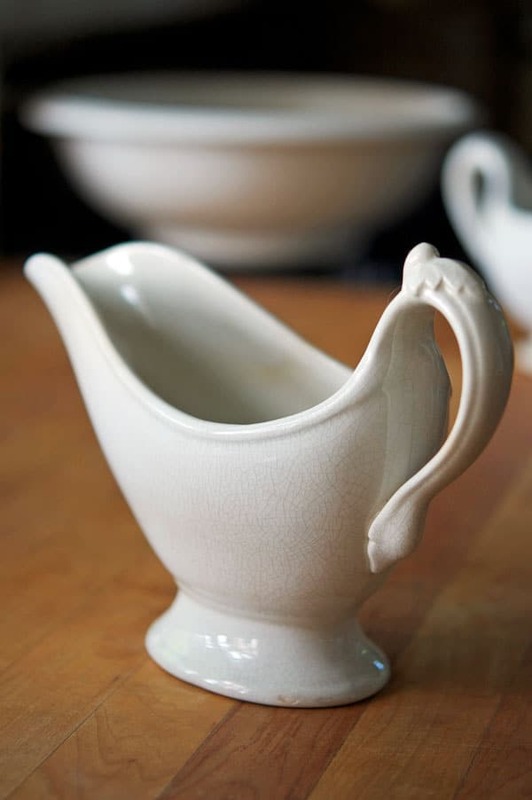 Ironstone comes in a variety of whites from blue white to creamy white. I don’t love the blueish white, and lean more towards the creamier ironstone. Ironstone also comes in transferware patterns, and yellowware, which are nice but not what I was looking for. Also when I’m buying Ironstone I look for it to have some character, but not so much character you’re afraid to eat out of it. The gravy boat above (which cost $24) has some mild yellow staining (patina) on the base and body. That’s the kind of character I look for. Crazing is another patina I like to see. Crazing is the very fine cracks in the glaze on the pottery. And then there’s the bowl. The great, big, bowl. This is an unmarked piece of Ironstone, that was the deal of the day at $10. It’s apple pie filling sized. Anyone who has ever made an apple pie knows what I’m talking about here. If I’m going to be perfectly honest with you all I’ll also say it’s cereal bowl sized. So my day at Christie’s allowed me to add a few good pieces to my Ironstone collection. And french fries to my belly. Every year I eat fries at Christie’s. Even when they started to cater to food trend lovers with healthy, organic food, I still eat my french fries and most years I’m only an ounce of embarrassment away from eating a giant turkey leg. The other thing I do every year at Christie’s is buy an egg basket. It’s not like a goal of mine every year, but somehow it happens. I buy an antique egg basket. This year I got the mother of all egg baskets as you can see on my island below. 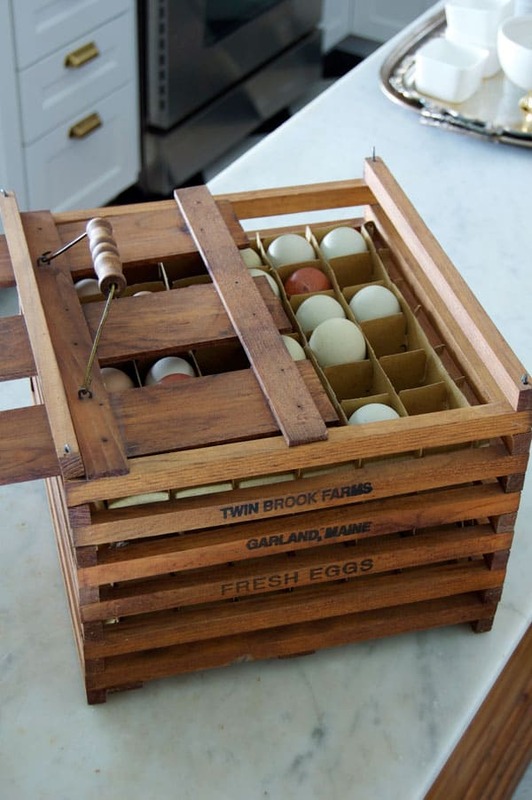 It’s a wood egg crate that was used for transporting eggs. It holds almost 150 eggs. If you look at the shelves near the top of the photo you can see the rest of my ironstone collection by the way. The crate came with the original cardboard separators. I’ve been looking at these crates for the past few years but they always seemed too big for my kitchen. But when I saw this one for $50 (I got it for $40) in perfect condition I caved and bought it. So the massive thing is on the counter for now until I decide to switch it out for a different egg holder. Since apparently now I collect egg holders. Really it’s one of the reasons I wanted chickens to begin with, because I liked the look of eggs on the counter. 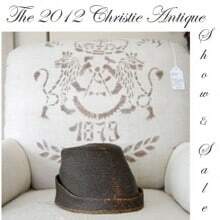 I already know what I’m going to be looking for at Christie’s this fall. I want a piece of ironstone that’s been mended. They used to mend bowls and platters by stapleing them together. They’re always stapled from the back so you can’t see the mend, but my dream would be to have a bowl or platter that’s mended from the right side so you can see it. Dream large, Karen. Dream large. I have no idea when I became this person. I mean I’m O.K. with being the girl who dreams of a perfectly imperfect ironstone bowl, I just don’t know when it happened. Probably happened around the same time I gave up my dream of being an evil genius. I have two of those egg crates in my garage. 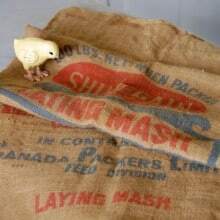 They were used by my Uncle’s mother to sell eggs. Since I don’t have chickens (one day, I hope I will) and not enough counter space, they are waiting for my creativity to kick in. Love yours! I can’t believe I’m first to comment! 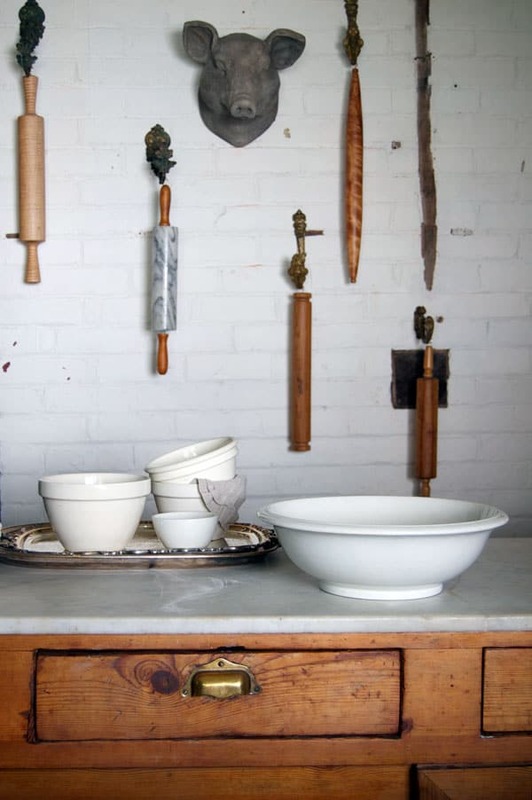 Beautiful collection of ironstone – you always find the most interesting things to collect. Also love your kitchen! Thanks glo! ( you somehow ended up being second to comment ) :/ ~ karen! I love ironstone too! I have several nice pieces and am always looking when I visit thrift stores and estate sales. That’s funny! It does look droop in the photo. No, it isn’t droopy but it does sit about 1/4″ below the other shelf. Not quite even. Maybe 1/8th of an inch which makes it droopy looking in the pic. ~ karen! In the pic of the brick wall with the rolling pins, is that drawer part of the island?? How did i not realize how perfectly worn it is? I am in love with that drawer. Seriously, that could possibly be the most perfect picture in the history of kitchen pics. I was enchanted with that large ironstone bowl until I noticed the drawer front on your island. That is a breathtakingly beautiful piece of furniture from that angle, and now I’m going to be upset because you usually don’t photograph from that side. I won’t be able to think about anything else for awhile. 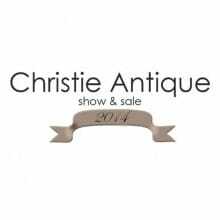 You bought the best stuff at Christie’s. 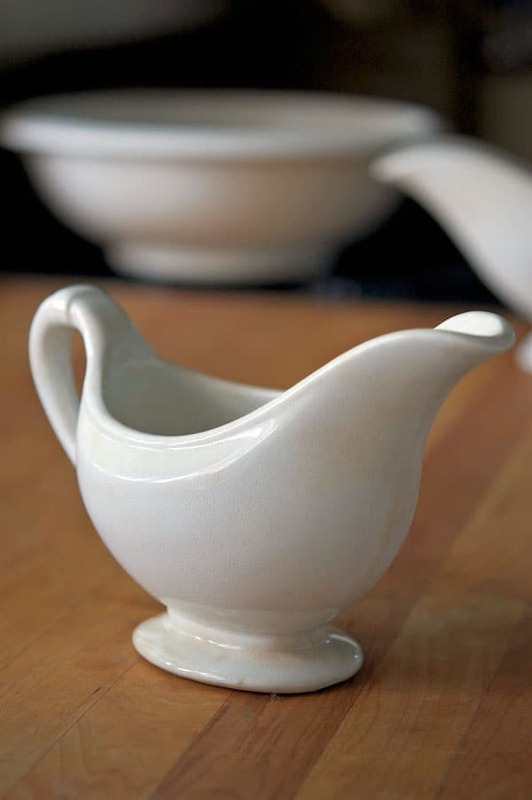 I have one ironstone gravy boat and it’s one of my favorite things. Beautiful that you have such a lovely collection of that creamy white goodness. LOL. That’s what Becky just said. I didn’t even really notice the drawer when I took the shot. I’ll try to get another shot of the island from that side, but because of where it is in the kitchen it’s really hard to photograph it. That’s why you don’t see that side often. ~ karen! Love the large bowl you bought. It would double up as an awesome pasta bowl too, not just for preparing apple pie filling! Have yourself and awesome weekend. 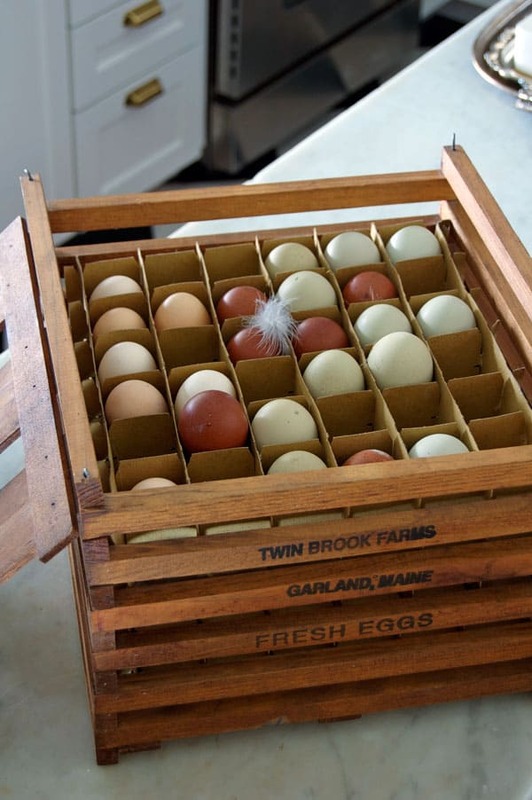 Love love love the egg crates – we don’t have things like that here – or sales like Christies! Sob! So I’m guessing that almost 150 eggs is 12o eggs. Commonly know as 10 dozen? And I’m guessing from the size and shape that the large and beautiful ironstone bowl is the basin half of a washstand set. What a great find! What a great price! But the killer is your wonderful island. Absolutely perfect. I’ve sort of discarded a number of blogs lately but you are a treat every time you post. Looks like each flat holds 36 eggs- if there’s four flat, that would be 144 eggs (almost 150) or 12 dozen. 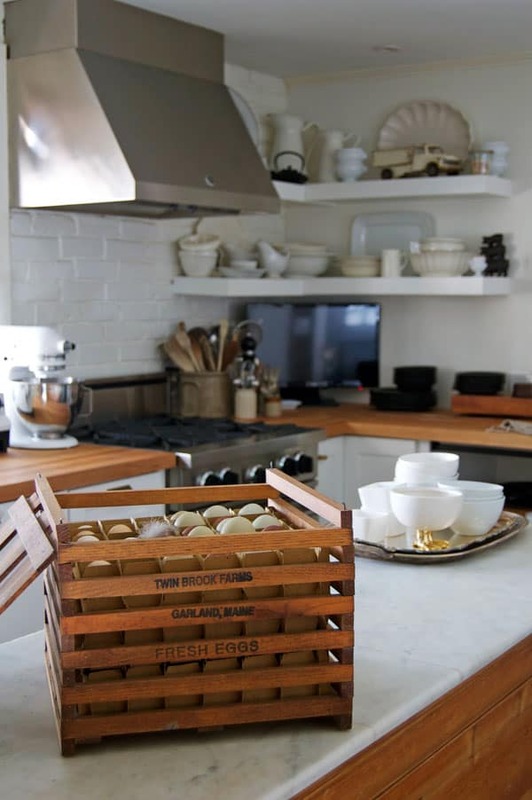 Love that egg holder, I would never have the space for it. But I am notorious for buying beautiful things that I don’t have room for. But that’s why I love the functional stuff. And I also love the look of eggs on the counter. I have a wire egg basket for mine- no chickens but for now I get eggs en masse from my BIL. But we have now have 8 ducks (supposedly 6 hens and 2 drakes, but time will tell), I’m gonna need a bigger boat… Well, basket. I love the kitchen shots, it seems it’s been awhile since we’ve seen much of your lovely kitchen. The ironstone does not arouse covetous desires to well up in my heart, but that iron pig in the fourth photo does. Must. Have. That. Porker. Seriously, I am coming to get it. Does your house have an alarm? Great finds Karen! I also covet your drawers lol Have a great weekend! More pics of the island please. What can be seen is gorgeous! If you have to, take picture bits then piece them together to show it all. What/how are you using to hang the rolling pins on the wall? 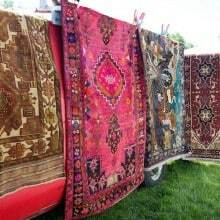 Maria – Those are antique French curtain tie backs. A friend gave them to me years ago and I knew I’d use them for something great one day I just didn’t know what. When I redid my kitchen I knew right away how I’d use them. 🙂 ~ karen! Call me dense ::sigh:: Love the tie backs, but how are the rolling pins attached to the tie backs? I’ve enlarged the picture and it appears as if there is some kind of ‘hook’ between the handle and the tie back. Did you attach a small cup hook to the wood handle? I don’t think so because besides being sacrilegious it would/could interfere when you’re rolling out dough. I don’t see a hole in the handles, and the one without handles I seen nothing attached to it to attach to the tie back ::sigh:: Just wondering. Thank you for answering. And love the egg crate!! Hi Maria. I did indeed screw little eye hooks into the ends of the pins. It doesn’t bother me at all either in terms of sacrilege or dough rolling. You don’t even know they’re there. 🙂 ~ karen! Ah, thank you for the answer. I have to go to the wall since I am extremely limited in storage/counter space. You’ve provided an answer. You got some awesome finds! I’m always on the hunt for Ironstone with crazing…some girls have booth’s full of it! Gotta love the hunt! Just a caveat, though: be wary about using old pieces that have crazing where the food will be. Depending on the extent of the crazing, old food can accumulate in the tiny cracks and remain there even after cleaning. It is also possible for chemicals in the glaze or pottery itself to leach out into food, which, oftentimes will include lead if the piece is older. It’s not an issue if you have say bread or potato chips in a dish, but from something “wet” or liquid. My mom got quite ill several years ago, something like the flu, but not. It would come & go in waves. Finally, some smart doctor put it together and realized the old pottery mug she had been using was the culprit. She stopped using her mug and her “illness” went away. That’s true Beckie. What’s interesting about the gravy boat (and a lot of pieces I find) is the crazing is only on the outside, not the inside. I’m not sure why that happens. ~ karen! I make apple pies so yes, it is the perfect bowl for all those apple slices. Its a beautiful bowl! And I love the old truck on the shelf. I’ve been looking for one to stuff with bottle brush Christmas trees. Are you sure Ironstone is not made from iron. It sure looks like rust to me at the bottom of the gravy boat. Just kidding but what does cause the staining? Still love the wall pig head and the duck feet bowl and the stacked iron piggies and the graceful curves of those gravy boats are fabulous. I have a weakness for creamy white. The walls in my house and my kitchen cabinets are a custom white I had mixed that is the exact color of half and half. I will never tire of it and I get sick of just about everything else after a while. I have a few pieces of ironstone – my favourite is a square bowl – I suspect it is a covered vegetable bowl because there appears to be a lip around the edge to hold a lid which, sadly, I do not have. Regardless, I love that bowl, the size and colour (the creamy white) and I use it often. I covet that big bowl and those two gravy boats. How lovely they are. I note that you have discerned that ironstone is particularly appealing when paired with silver plate (the bowls in the tray on the island). I have an obsession with that stuff. It’s a good thing I don’t mind polishing it. The ironstone pieces you have are beautiful. The apple slices bowl is wonderful. Congrats on another example of you artiness! Collect on! Genius, yes. Evil, I don’t think so. Looks like you had a great day. I love going out shopping and when I find those special items, well, that just makes it all the better. I’m home recovering from knee implant surgery so your post was a very welcome relief from the therapy (hurts, but in a good way) thanks again for enjoyable reading. I’m a little bit evil. I’m pretty sure. Sorry about your knee. Work through the pain and heal away! ~ karen! Also – I’m a big fan of creamy Ironstone and raised my girls eating off of it. Now that they’re grown and starting their own kitchens guess what they are collecting for themselves? Makes me insanely happy to see how much of an effect that had on them. Hi Karin! I’ve also seen people use wine racks for rolling pins. ~ karen! I like to know what is printed on the bottom of the pieces, if anything. Sometimes the makers mark is on the bottom Rondina and sometimes it is even stamped “ironstone”. Other times there’s nothing there. It just depends on who made it. Most of my pieces are marked, but this bowl has nothing. You get to just learn what ironstone looks and feels like. ~ karen! If you have an Ironstone large bowl with any type of food stuff in it and another identically sized ‘patterned’ piece of dish ware – what is contained in the Ironstone always looks more attractive because the food is not competing with the pattern design of the bowl. It is difficult to locate quality dish ware to pair with Ironstone pieces although Denby has some rather simple creamy coloured offerings without associated patterning. Great stories to go with great pieces! these photos show off your kitchen so beautifully! My house has also outgrown my 40’s/50’s collections, in part. I’m curious what you’ve done with yours… did you sell them, give them away? Or are you hoarding them needlessly in rubbermaids like myself? They’re sitting in a cupboard while I decide what to do with them. Or forget about them. Whichever comes first. ~ karen! A bit of both KowboyK. The ironstone is sometimes marked with a makers mark, and sometimes it even is marked ironstone. Other times there’s no markings at all. You get to know the look and the feel of it. ~ karen! The big bowl may be terrific for apple pie making and cereal, but its real use is for ice cream! I look forward to reading your blog. I’m wondering also, What stamp if any in on the bottom? Please? Thanks!! HI Ann. The bowl has no stamp. But my other ironstone pieces often have “ironstone” stamped on them with the makers mark. ~ karen! Pretty Ironstone..I don’t know how to tell the difference between that and a cheap white ceramic piece..The egg crate is awesome..and BIG!! Yes, it’s ridiculously large, lol. Like my toes. ~ karen! I love that white ironstone, especially that apple pie bowl. Yes, I know exactly what you are talking about. As for the egg box… I can’t even! Wow, Karen… You have the best kitchen! The bowls-n-boats are so fabulous. Perfect for giant servings of ice cream and boats of chocolate syrup! Thanks Cathy. I’m really happy with how it turned out. PLUS it’s completely functional. ~ karen! Ironstone has such an interesting history! I thought the evil genius’ little lie was a masterful trick. I love the egg crate on your island! Also, I like that it was actually filled with eggs! Thanks Hailey. It’s the first egg basket/crate I’ve owned that’s big enough to fit all my eggs into. I can’t imagine filling the whole thing, but the top layer is perfect. 🙂 ~ karen! How do you know Ironstone is Ironstone? Did they write on the base of these things back in the day? Enquiring minds would like to know…. You just get to know the look and the feel of it Ruth. Some pieces even have “ironstone” stamped on the bottom. The makers did this to prove it was genuine ironstone which all the manufacturers prided themselves on because it was supposed to be so strong. ~ karen! 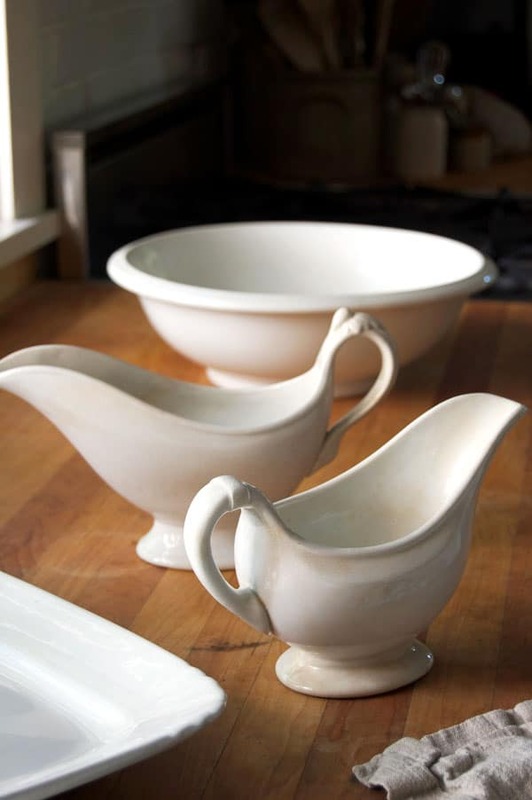 White Ironstone: beautiful utilitarian pieces. I’ve collected since the 90’s buying unique and useful pieces. Then Martha S. featured ironstone on shelves in her TV kitchen and my collection skyrocketed in value. That fact was nice but, I couldn’t afford to add to my collection and dealers were buying up all they could find along with the new\antique pieces being made. White ironstone, black and white aesthetic transferware on ironstone look great sitting on beautiful cherry wood like your gravy boat pictured and on mahogany shelves or countertops.. I Love your egg basket. Thanks for a great article. Thanks Linda. I pretty much love it too. 🙂 ~ karen! 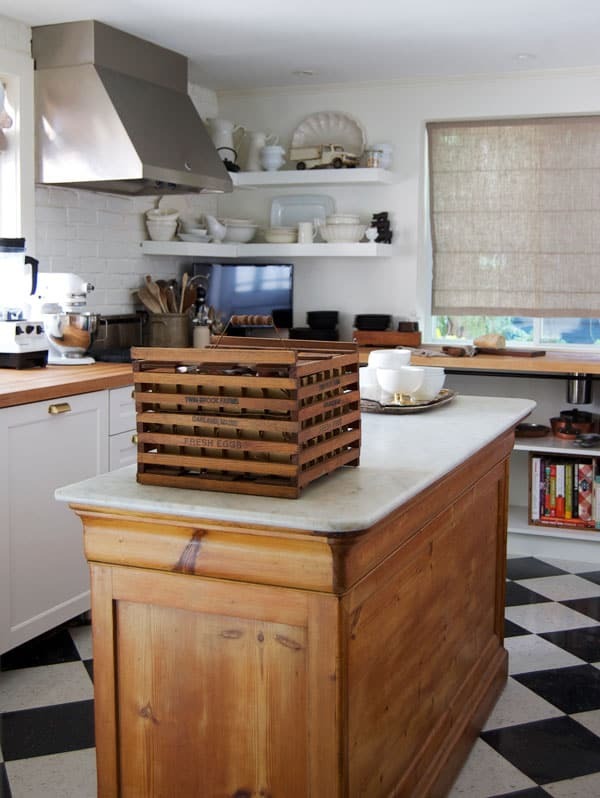 Where did you get the roman shade in your kitchen? Hi Catherine. I actually made it with fabric from Rough Linen. (more specifically my mom made it for me, lol). ~ karen! I had a hysterectomy and was stapled in the front – believe me it was not pretty with those big fat metal staples. They used a special staple remover to spring them open and remove them and after 40 years, those marks are still red and itchy when I get hot. “Yes I bath daily.” Must be metal rust in my belly. I do NOT want a bowl that reminds me of that so if I come across one, I’ll send it to you. Your Ironware looks great and thank for a little history – I LOVE trivia like that. Thanks to you and your belly Mary W ! ~ karen! Um, can we talk about that gold duck legged bowl please?? Am I the only one seeing this little beauty? We can! I’ve talked about it before. I got it at a store in Dundas but she doesn’t have any more. 🙁 ~ karen! ah … Christie! always a great time. Have you tried the deep fried apples smothered in sugar and cinnamon?? Saw a platter stapled in the front, but it was a teal transferware, not white ironstone. Maybe you’ll find more in September?